Pests in the garden can be so discouraging! One of the things I hear from beginning gardeners is that they have no idea where to start when it comes to bugs. In some cases, I've had folks tell me they've given up on having a garden simply because of pest issues. That's no fun! But don't give up on growing your own food! Dealing with bugs is something every gardener has to think about, not just beginners. So what should you do? One of the best things about growing your own food is having control of how it's grown, and that includes how pests are dealt with. We have always practiced organic gardening and I'm happy to say I have never used a single chemical in our garden. 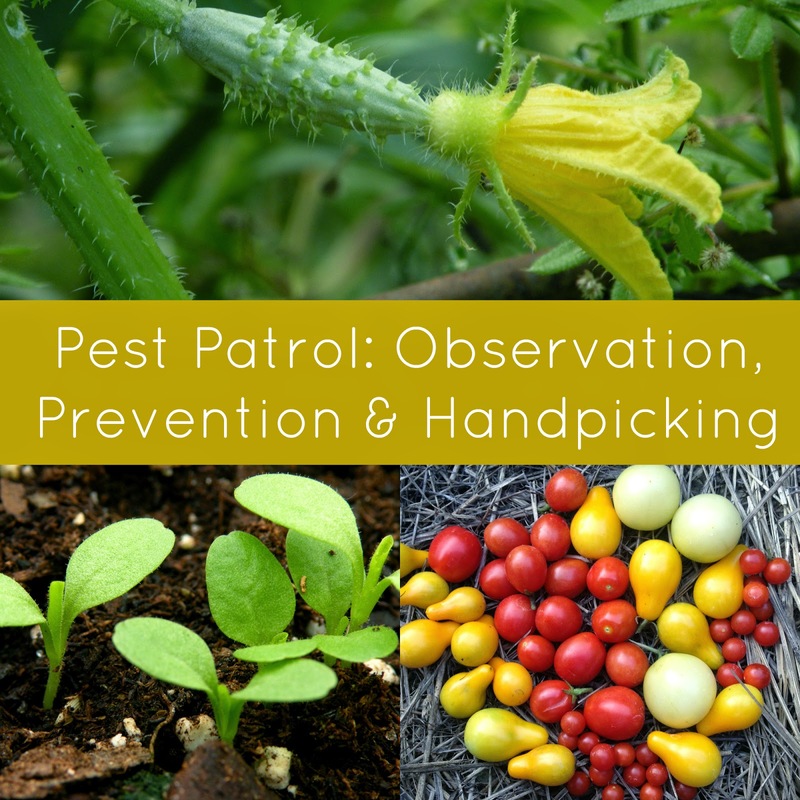 My favorite method for dealing with pests involves a few things: careful observation, prevention, and hand picking. We will start with the first one: careful observation. From the first day you plant your garden, really look at the soil and your plants. Look at them each day. If you've had a garden for years, you can probably spot an issue immediately. But for those that are just starting, learning how your plants look on a daily basis is the best way to realize something is going wrong. This doesn't just apply to pests either. A walk through your garden each day looking over your plants will help you learn a lot. Look at the leaves, stems, and ground surrounding them. If you're looking at your garden each day, you will notice easily when a group of bugs try to move in and you can deal with it before it ever becomes a problem. Through your observation you will most certainly see bugs. Many of them you will recognize. But some you will not. Take a picture of those you aren't familiar with and find out what they are, even if they don't seem to be causing a problem. A great resource is this book: The Organic Gardener's Handbook of Natural Pest and Disease Control. Just because a bug doesn't appear to be harming your garden doesn't mean that's the case, and just because a bug looks scary doesn't mean it's harmful. If you find out the bug is harmless, you don't need to take any action. But if you find out that it will ruin your tomato crop for the year, you will be happy you took the time to check. Prevention is a huge tool as well. This goes hand in hand with observation, by stopping a problem before it gets going. My favorite preventative method is row covers. I cover all my squash, cucumbers, gourds, and melons with row covers in the beginning of the season each year because I know certain pests are prevalent in my area. Row covers are cheap and can even be reused from year to year. You do need to have some idea of the pests in your area in order to properly prevent them. Talking to your neighbors or other gardeners nearby can be an amazing resource for you as you begin to create your own garden. Another preventative measure is crop rotation, which involves rotating your crops locations in the garden from year to year. Many bugs lay eggs in the soil near certain plants, so the next year when you plant your broccoli in the same spot, the babies emerge right into a delicious meal. Rotating your crops can really help to cut down on both pests and diseases. Lastly, hand picking is my favorite method of pest removal. I can see some of you beginning to squirm! I promise it's not as bad or as gross as it sounds. Simply wearing gloves can help to take away some of your squeamishness. Once you have noticed and properly identified your garden pest and have determined they need to be removed, it's time to get your gloves out! Get a bucket of water and add a few drops of liquid dish soap. This creates surface tension in the water so the bugs cannot simply climb out. Going through each plant, checking the undersides of leaves as well, remove all visible pests and eggs and drop them into the bucket. No squishing necessary! Removing bugs before they do damage to your crops is essential to getting a good harvest. Hand picking pests does not involve any pesticides, so it's safe both for you and your garden, and it's free! Hand picking pests early in the season before they have a chance to get established in your garden and reproduce, is well worth the effort. So remember, through observation, prevention and hand picking, you'll gain the upper hand on garden pests! This is a great intro into your new series (which I'm so excited about!) I'm up against my first pest of the grow season: flies on my cucumbers / lettuce. I've been digging around online to try + find a reason / solution!